To protect the health of your teeth and gums, you brush your teeth well each day and visit your family dentist in Temple. You may think that you are doing a good job so you do not need to floss unless something gets stuck in your teeth. However, even with the best brushing habits, your toothbrush cannot reach in between the teeth or around the gum line. As a result, if you are not flossing, you are letting plaque and tartar build, increasing your risk for gum disease. At Fossum Dental Group, we know that you do not like to floss, but we encourage you to make it part of your oral hygiene routine to protect your smile. 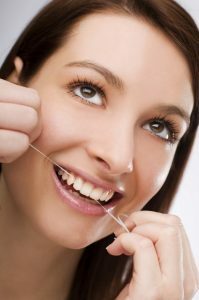 All too often, it is believed that flossing is not an effective aspect of dental hygiene. In fact, most people view it as a chore, admitting that they would rather do the dishes or clean toilets instead. With over half of adults suffering from a form of gum disease, you need to ensure you are flossing each day—no matter how much you dislike it. It is estimated that only four out of ten Americans floss daily. The low percentage is somewhat due to a recent article that says it is ineffective for preventing gum disease. However, there is strong clinical proof showing that it is the best preventive measure to protect your gum health. Adding flossing into your daily oral hygiene routine only takes a couple of extra minutes. It all starts with choosing a great floss. There are many different types available; however, you will want to choose one that has the American Dental Association’s Seal of Acceptance to ensure that it is safe to use. Then, determine a time throughout your day when you can commit to it. It does not matter if you floss before or after you brush, but it is often preferred to do it before going to bed, which is when bacteria tend to increase. To remove the plaque and tartar buildup, choose a length of floss that will allow you to clean the teeth comfortably. This is usually around 12 to 18 inches. Then, insert it between two teeth and form a “C” shape around one tooth. Gently slide it to the gum line with a back and forth motion. Be careful not to snap it on the tissue. Finally, slide it back up to the crown and repeat this process for each tooth. Brushing and flossing are the first line of defense against gum disease. However, in addition to your home oral hygiene habits, you also need to see your dentist in Temple twice a year for a cleaning and checkup. At Fossum Dental Group, we offer the preventive care you need to keep your gums healthy. If gum disease does develop, we will create a proactive approach to restore your oral health. Contact our office today to schedule your appointment.